At Beacon Pointe, we take financial literacy to heart; so much so that we have a dedicated group of professionals who actively educate, empower and engage individuals within our community to take hold of their financial futures. We are excited to share with you the recent publishing of our new book Your Dollars, Our Sense: A Fun & Simple Guide to Money Matters which is now an international best seller having ranked #1 across six different business and finance categories. Beacon Pointe created Your Dollars, Our Sense for a multi-generational audience to empower readers to develop an intimate knowledge around personal finance and help them easily make informed decisions. The book addresses money matters at every life stage including, but not limited to, topics such as credit, savings, home ownership, investing, insurance, family planning, retirement, estate planning and more. 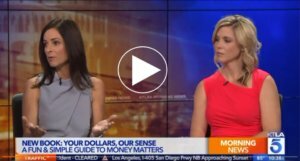 Two of our co-authors were featured the on KTLA 5 Morning Show to showcase and discuss topics from the book. Click HERE for the full interview. Your Dollars, Our Sense can be purchased on Amazon in hard cover, paperback and e-reader formats, where it is currently rated at 5-stars from 50+ customer reviews and was ranked Top 10 in the Wealth Management and Mentoring & Coaching categories within its first 48 hours of publication.